Acute Pain nursing diagnosis is defined as an unpleasant sensory and emotional experience arising from actual or potential tissue damage or described in terms of such damage (International Association for the Study of Pain); sudden or slow onset of any intensity from mild to severe with an anticipated or predictable end and a duration of less than six (6) months. The unpleasant feeling of pain is highly subjective in nature that may be experienced by the patient. Acute Pain serves a protective function to make the patient informed and knowledgeable about the presence of an injury or illness. The unexpected onset of Acute Pain reminds the patient to seek support, assistance, and relief. The physiological signs that occur with Acute Pain emerge from the body’s response to pain as stressor. Other factors such as the patient’s cultural background, emotions, and psychological or spiritual discomfort may contribute to the suffering with Acute Pain. In older patients, assessment of pain can be challenging due to cognitive impairment and sensory-perceptual deficits. 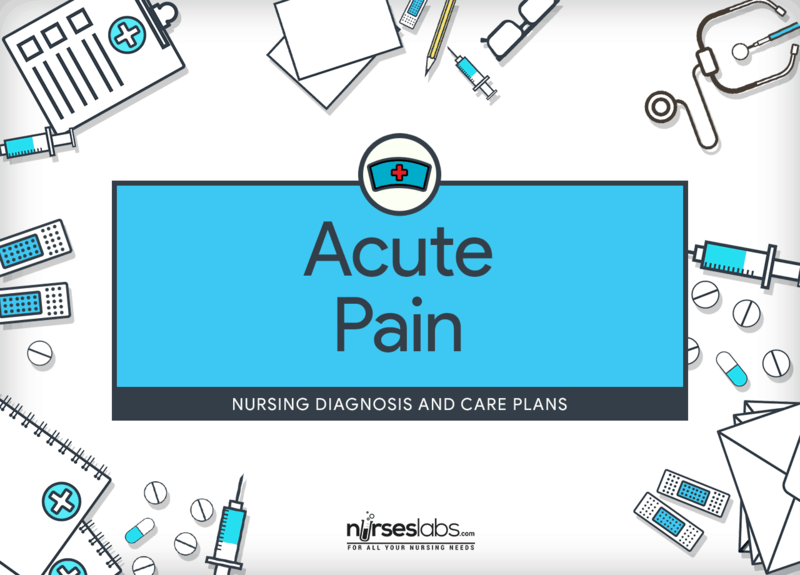 Assessment and management of the nursing diagnosis of Acute Pain are the main focus of this care plan. Patient describes satisfactory pain control at a level less than 3 to 4 on a rating scale of 0 to 10. Patient displays improved well-being such as baseline levels for pulse, BP, respirations, and relaxed muscle tone or body posture. Patient uses pharmacological and nonpharmacological pain-relief strategies. Patient displays improvement in mood, coping. Assessment of pain experience is the first step in planning pain management strategies. The most reliable source of information about the pain is the patient. Descriptive scales such as a visual analogue can be utilized to distinguish the degree of pain. Assess for signs and symptoms relating to pain. Some people deny the existence of pain. Attention to associated signs may help the nurse in evaluating pain. An increase in BP, HR, and temperature may be present in a patient with acute pain. The patient’s skin may be pale and cool to touch. Restlessness and inability to concentrate are also some manifestations. Assess to what degree cultural, environmental, intrapersonal, and intrapsychic factors may contribute to pain or pain relief. Such variables play a big role in modifying the patient’s expression of pain. Some cultures simply express feelings, whereas others hold such expression. Nevertheless, health care providers should not prejudge any patient response but rather evaluate the unique response of each individual. Assess the patent’s anticipation for pain relief. Some patients may be satisfied when pain is no longer massive; others will demand complete elimination of pain. This influences the perceptions of the effectiveness of the treatment of the treatment modality and their eagerness to engage in further treatments. Assess the patient’s willingness or ability to explore a range of techniques aimed at controlling pain. Other patients may be overlooking of the effectiveness of nonpharmacological methods and may be willing to try them, either with or instead of traditional analgesic medications. Often a combination of therapies (e.g., mild analgesics with distraction or heat) may be more effective. Some patients will feel uncomfortable exploring alternative methods of pain relief. However, patients need to be acquainted that there are other approaches to manage pain. In the hospice or home setting, a nurse or caregiver may be needed to assist the patient in managing the infusion. Weigh the amount of pain medication the patient is using to his or her reports of pain. If requests for medication are quite frequent, the patient’s dosage may need to be increased to promote pain relief. if requests are very low, the patient may require further guidance to correctly use PCA. Potential PCA complications such as excessive sedation; respiratory distress; urinary retention; nausea and vomiting; constipation; and IV site pain, or swelling Early assessment of complication is required to prevent serious adverse reactions to opioid analgesics. Tingling in the extremities, numbness, a metallic taste in the mouth These symptoms may be indicators of an allergic response to the anesthesia agent or of incorrect catheter placement. Potential epidural analgesia complications such as extreme sedation, respiratory distress, urinary retention, or catheter migration Respiratory depression and intravascular infusion of anesthesia (resulting from catheter migration) can be potentially life threatening. Evaluate the patient’s response to pain and management strategies. It is essential to assist patients express as factually as possible (i.e., without the effect of mood, emotion, or anxiety) the effect of pain relief measures. Inconsistencies between behavior or appearance and what the patient says about pain relief (or lack of it) may be more a reflection of other methods the patient is using to cope with the pain rather than pain relief itself. Evaluate what the pain suggests to the patient. The meaning of pain will directly determine the patient’s response. Some patients, especially the dying, may consider that the “act of suffering” meets a spiritual need. Foresee the need for pain relief. Preventing the pain is one thing that a patient experiencing it can consider. Early intervention may decrease the total amount of analgesic required. Acknowledge reports of pain immediately. One’s perception of time may become distorted during painful experiences. Pain can be aggravated with anxiety and fear especially when pain is delayed. An immediate response to reports of pain may decrease anxiety in the patient. Demonstrated concern for the patient’s welfare and comfort fosters the development of trusting relationship. Get rid of additional stressors or sources of discomfort whenever possible. Patients may experience an exaggeration in pain or a decreased ability to tolerate painful stimuli if environmental, intrapersonal, or intrapsychic factors are further stressing them. Provide rest periods to promote relief, sleep, and relaxation. One’s experiences of pain may become exaggerated as a result of exhaustion. Pain may result in fatigue, which may result in exaggerated pain. A peaceful and quiet environment may facilitate rest. Determine the appropriate pain relief method. Patients with acute pain should be given a nonopioid analgesic around-the-clock unless contraindicated. NSAIDs work in peripheral tissues. Some block the synthesis of prostaglandins, which stimulate nociceptors. They are effective in managing mild to moderate pain. Opioids may be administered orally, intravenously, systemically by PCA systems, or epidurally (either by bolus or continuous infusion). Intramuscular injections are not reliably absorbed. Opioids are indicated for severe pain, especially in the hospice or home setting. Local anesthetics block pain transmission and are used for pain in specific areas of nerve distribution. The aid of an imagined event or a mental picture involves use of the five senses to divert oneself from painful stimuli. Increasing one’s concentration, these techniques help an individual decrease the pain experience. Breathing modifications and nerve stimulations are some of the methods. The aim of these techniques is to lessen the stress, tension, subsequently decreasing the pain. Massage of the affected area when suitable A massage traps pain transmission, increases endorphin levels, and minimizes tissue edema. This method requires another person to perform the massage. Transcutaneous electrical nerve stimulation (TENS) units TENS demands the application of two or four skin electrodes. Pain modulation happens through a mild electrical current. The patient is able to control the intensity and frequency of the electrical stimulation. Heat decreases pain through improved blood blow to the area and through reduction of pain reflexes. Cold lessens pain, inflammation, and muscle spasticity by decreasing the release of pain-inducing chemicals and regulating the conduction of pain impulses. Provide analgesics as ordered, evaluating the effectiveness and inspecting for any signs and symptoms of adverse effects. Effectiveness of pain medications must be evaluated individually because it is absorbed and metabolized differently by patients. Analgesics may cause mild to severe side effects. Report to the physician when interventions are unsuccessful and ineffective. Patients who demand pain medications at more frequent intervals than prescribed may actually require higher doses or more potent analgesics. Remind the patient that pain is limited and that there are other approaches to minimizing pain. Patient may give up trying to cope with pain when he or she perceives pain as everlasting and unresolvable. Restrict the use of an IV line for PCA only; ask a pharmacist before combining other drugs with opioids being infused. Unexpected IV incompatibilities may occur. Label all tubing (e.g., epidural catheter, IV tubing to epidural catheter) clearly to prevent the accidental administration of unseemly fluids or drugs into the epidural space. Improper use of an epidural catheter can result to neurological injury or infection. Place a “No additional analgesia” warning over the bed. This prevents inadvertent analgesic overdosing. Keep Narcan or other opioid-reversing agents readily available. These drugs reverse the opioid effect in case of respiratory depression.